Although you can configure an ungraded subsection to be timed, typically you set a time limit on graded subsections, such as for mid-term or final exams. When learners take a timed exam, a timer on the exam page counts down and provides alerts as the time limit approaches. When no time remains, learners can no longer access additional exam content, or submit additional responses to the subsection. All problems that were completed are graded. No points are awarded for unsubmitted problems. Course teams can grant individual learners more time to complete problems in the subsection, but only if learners request additional time before starting a timed exam. Learners cannot complete timed exams using the edX mobile app. To better understand the learner’s experience of timed exams, see Taking a Timed Exam in the edX Learner’s Guide or Taking a Timed Exam in the Open edX Learner’s Guide. 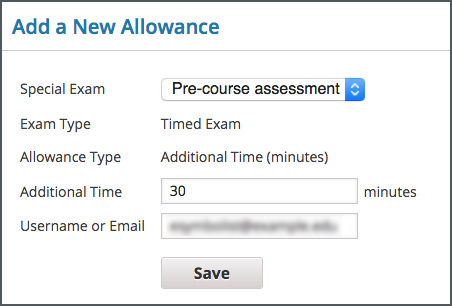 The Enable Timed Exams field appears in the Advanced Settings page for your course even if timed exams are not enabled for your Open edX site. 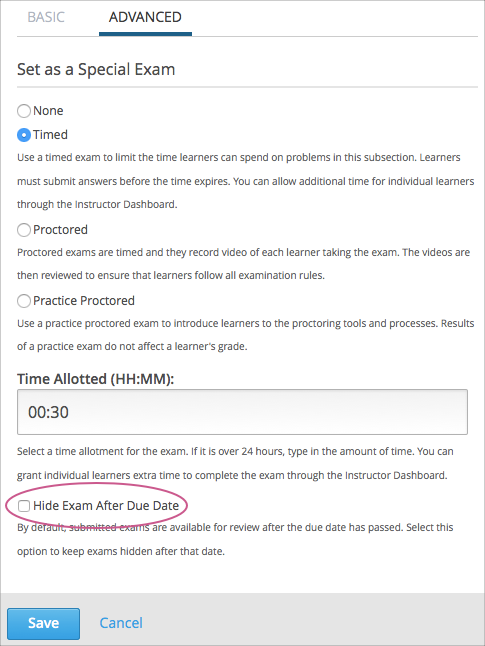 If you enable timed exams for a course, but special exams are not enabled for your site, you will not be able to include timed exams. Enabling timed exams for an Open edX site is a task that is usually performed by a system administrator. For more information, see Enabling Timed Exams in Installing, Configuring, and Running the Open edX Platform. If the Settings dialog box does not contain the Advanced tab, timed exams might not be enabled for your Open edX site. Enabling timed exams for an Open edX site is a task that is usually performed by a system administrator. For more information, see Enabling Timed Exams in Installing, Configuring, and Running the Open edX Platform. In the Additional Time field, enter the number of extra minutes that you are granting the learner.